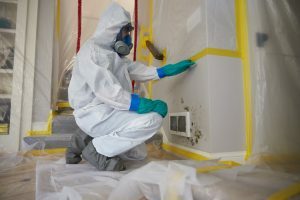 As an IICRC Certified Applied Microbial Remediation Supervisor, ServiceMaster Restoration By Simons offers a few tips to protect your property from Mold Damage. While people with asthma and allergies are especially sensitive to mold, everyone is susceptible to respiratory problems. Aside from health risks, mold can contaminate and damage your personal belongings. Steps to Take After a Disaster. To protect you and your family from mold damage, it’s essential to know what to do immediately following a disaster that includes water and excessive moisture. Following these steps can help prevent mold growth and teach you how to safely handle the situation. Open doors and windows. Since moisture contributes to mold growth, it’s crucial to dry out the damaged area. Opening doors and windows allows air to circulate, helping dry the inside of your home or business. The first 24-48 hours after a disaster is the most vital window to combat mold growth, so be sure to dry the building as quickly as possible. Avoid mixing bleach with household cleaners. For people that weren’t able to prevent mold growth, commercial cleaners such as bleach are popular options for mold removal. However, it’s important to remember that you should never mix bleach with ammonia or any commercial cleaner. Mixing bleach with cleaners creates toxic fumes that are dangerous for you and your family. As always, remember to wear protective eyewear and gloves to protect yourself while cleaning infected areas. Consider using disaster restoration professionals. While you may be able to salvage personal belongings and furniture from mold damage, wet carpet, walls, insulation, and other sensitive parts of your home may grow mold or even be a home to dead mold. These items can create a dangerous situation for you and your family if they’re not professionally treated. If the water damage is serious, chances are you’ll want to replace carpet and insulation to prevent health risks and long-term house damage. Call ServiceMaster Restoration by Simons for immediate mold remediation services. Don’t expose your family to Mold & Mildew. We’ll come out & give you a free estimate. Call now at 773-376-1110. Serving Chicago and wherever our services are needed.